Anna Ford grew up deeply immersed in racing and showing horses. Her parents own a small private racing and breeding operation near Dayton, Ohio. Ford is a graduate of Ohio State University with a degree in Communications. She is also a World Champion Equestrian, has trained and instructed internationally, and is a Masters Certified Instructor through the Certified Horsemen’s Association. Ford has a wealth of experience with both Standardbreds and Thoroughbreds. Growing up, she spent many days helping her fifth generation trainer/driver dad with his racing stable. She also assisted on the farm handling the foals, breeding mares, and prepping horses for sales. Ford rode Standardbreds and Thoroughbreds throughout her youth and showed heavily in a variety of disciplines. She was an exercise rider during college prior to her position with New Vocations. 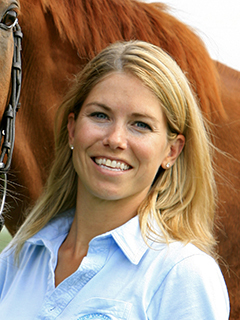 Ford is the Thoroughbred Program Director for New Vocations Racehorse Adoption Program.